I guess this is a bit like “he said” — “she said”. The previous post was from Te-chan’s take on our experience. This is mine. No, I am not talking about us! 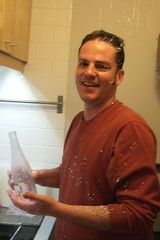 I’m talking about sake! And, you will get a chance to read Melinda’s version, too. Just as expressed by one of their brand name, the people at Kinpou in Fukushima are odayaka (calm) yet very passionate about preserving the local rice growing culture and making sake. When I left the kura on one Saturday in March after the sake making experience event, I felt totally intoxicated not by sake, but by the experience as a whole, as well as the good feeling I had throughout the day. Kinpou started to host rice growing and sake making events this year, hoping to communicate their mission to preserve the local rice fields to as many people as possible. They are sort of evangelists or leaders in local rice field preservation in Tamura-cho, Fukushima, and hope the experience in the field would help people resonate with their philosophy. From May through November, they hosted a couple of workshops at their rice field: planting rice, pulling weeds, and harvesting rice. For a kura that cares so much about rice, preserving the rice fields also means being good to the environment as well as to their sake. At this point, 91% of their sake this year is made with organic rice, and by 2011 they plan to have 100% organic rice sake. Having this much enthusiasm for and understanding of rice growing and co-existing with the local environment must be one of the reasons their sake “feels” so good. It tastes good, of course, but there was something more to them when I was first introduced to this wonderful kura. 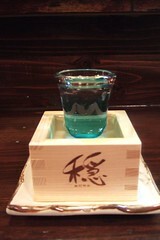 It was at our last deadly sake tasting where the group voted Odayaka as the best kan and cold sake. Later, we found out the kura was having an event in March and inviting people for Doburoku and sake making events. On March 10th, Melinda, JP, Te-chan and I were on the Shinkansen bright and early on the way to our sake adventure with over twenty people at Kinpou. Other people in the group who attended all Kinpou events throughout the year, including harvesting and planting rice, said that sake making was actually the easiest part of all. I can imagine the tasks we had: lifting 20kg of rice, washing rice in ice cold water, or scooping steamed rice with a huge shovel are so much easier than the back breaking field work. Still, some work at the kura on that day gave me a feel for the hard labor involved in sake making and made me appreciate sake even more. On the way back, thinking back, I was trying to understand why I felt so good throughout the day. The whole experience was fun, I learned a lot about the sake making process and they fed us well with organic rice onigiri, nabe, and a Fukushima local dish with carrots and dried squid for lunch. That’s part of it. It’s more than that, though. Was it the quiet but powerful enthusiasm toward sake and rice everyone at kura shared? Was it their warm and proud gaze, like that of proud parents, toward the rice, the moromi, and the whole process? 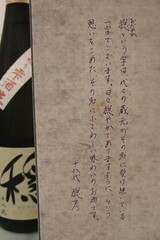 Modestly, Mr. Niida says their sake is not perfect yet, and they want to improve it every year. Yes, the same phrases you often hear from parents talking about their kids. Two weeks later when we received the doburoku from the event, it tasted so good and again felt so good as we enjoyed its smooth dry taste. Oh, I know, eventually you will get that chance…Sorry I’m so lazy! Remember how it took me a month to finally write up that Mansakuno Hana? Great job, Et-chan! 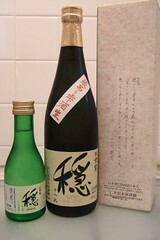 I’m down for sake making with you again any time. I always suffer from the same thing-a lot of things I want to write about, too little time. I look forward to your post. Now you gave me a shukudai to think about why I blog, I’d better give some thoughts to it. I’d better get cracking on the shukudai you gave me, too! Omatase shimashita. Shukudai dekita yo! Cool. Now, I can tell you a little secret about Doburoku No.2. I think this picture pretty much tells you everything. But if it’s any consolation, I had a similar run-in with a bottle of Momo no Kawa Taruzake…Remember how i cowered when Ted opened up doburoku #1? I must add he shook it even harder than #1. I know, I know, you told him. You know men…..